For most people, a chainsaw is simply something villains of a scary movie use—perhaps they think of lumber jacks. However, for millions of people who either own land, live near the woods, or work outdoors, chainsaws are a vital piece of equipment. Of course, nothing lasts forever, and eventually, a chainsaws chain will need to be switched out. However, if you know how to sharpen the teeth of the chain, you can drastically cut down the ongoing operational costs of your chainsaw. Unfortunately, sharpening the teeth manually is tedious and using a hand tool requires practiced skill. 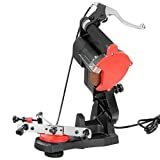 That is why we have assembled a list of the top three electric mounted chainsaw sharpeners available as well as a budget option. With these tools, you can take a job that requires time or skill and run right through it. The Gold Pick Winner goes to a model developed by the Oregon Chainsaw Company. This company has a long and storied history centered around chainsaw and chainsaw accessory production. In the chainsaw market, the Oregon chainsaw sharpeners are generally regarded as the best electric mounted chainsaw sharpeners available. It should still be noted, that this is not a commercial grade chainsaw sharpener. If you need a commercial grade chainsaw sharpener, then you will likely have to spend a considerable amount of money more. Still, this is a top of the line consumer chainsaw sharpener that is more than capable of handling the commercial needs of a small lawn care crew that regularly uses chainsaws. The point is, if you run a business that handles the clearing of acres of lumber, this chainsaw sharpener will not be able to keep up with the demand of chain teeth that need to be sharpened. One thing that might strike out to the casual observer who is looking for a chainsaw sharpener is the Oregon’s rpm. The Oregon chainsaw sharpener runs at 3,500 rpms. Out of all the chainsaw sharpeners on this list, that is the lowest number of rpms. In fact, it is only 100 rpms lower than the second place finisher on this list. It is over 500 rpms lower than the third place and budget pick. This should give you an idea of how these machines are supposed to run. Unlike many other types of power tools, the highest number is not always the best. The relatively low number of rpms is actually a safety measure. This is designed to prevent the grinding wheel from weakening or breaking the chain while it sharpens the teeth. Much of the power generated by a chainsaw sharpener is not necessarily determined strictly by the rpms. In fact, a motor that does not handle resistance or friction as well can easily handle much higher rpms. This is why the rpms are kept somewhat low. The Oregon has a fairly powerful motor that boasts almost one half of a horsepower. Keep in mind, this is still an electric motor, not a gas powered engine. The motor itself is so powerful, considering the relatively small size of the tool, specifically so it can handle the resistance encountered when grinding the teeth on the chain. The motor also runs on 120V of power which is considerably more than most of the entries on this list. All of the qualities combine to present a motor that is powerful, but not too powerful. This also generates an adequate amount of rpms to sharpen the teeth of a chain without risking the creation of too much friction or heat such that the chain becomes weakened or breaks. A well-balanced grinding action is not the only reason the Oregon takes the top prize of our list. It is also incredibly versatile. Many chainsaw sharpeners either are only effective on the most common types of chainsaw chains, or they require numerous attachments of grinding wheels to sharpen the teeth of different chains. The Oregon makes it a point to be able to sharpen almost any chainsaw’s teeth. The Oregon comes with three separate grinding wheels of three sixteenths of an inch, one eighth of an inch, and one quarter inch thickness. These three grinding wheels allow the Oregon to work on chains that have a wide diversity of teeth size. This chainsaw sharpener can handle one quarter of an inch, three eights of an inch low profile, .325 inch, three eights of an inch, and .404-inch pitch chains. This is by far the most versatile chainsaw sharpener of the bunch and allows more chain types than any of the others on this list. Another feature that places the Oregon a step above the rest is its frame and mounting style. This chainsaw grinder easily has the most metal components of its frame with the hard plastic components generally being limited to the motor housing, knobs, and handles—And most of the motor itself is also housed in metal parts. This means that the Oregon is far more stable than the other entries on this list and will not vibrate as much. When you are grinding the teeth of a chainsaw chain that are generally less than half an inch, the less vibration the better to maintain as much precision as possible. Of course, all of this metal inherently makes the Oregon the most durable chainsaw sharpener on the list as well. Some of the other features that are simply nice additions include a wheel wear indicator which tells you when it is time to change out your grinding wheel. There are also numerous features designed to ensure that the teeth of you chain are perfectly aligned which include a dressing brick, a quick check grinding template, a built in light. Moreover, the Oregon has a one-way motor which is much safer and lessens the chance of injury or fabric getting caught in the grinding wheel. All of these features add up to an incredibly convenient chainsaw sharpener, and when you combine that with the superior grinding action, you get the best in the consumer market. 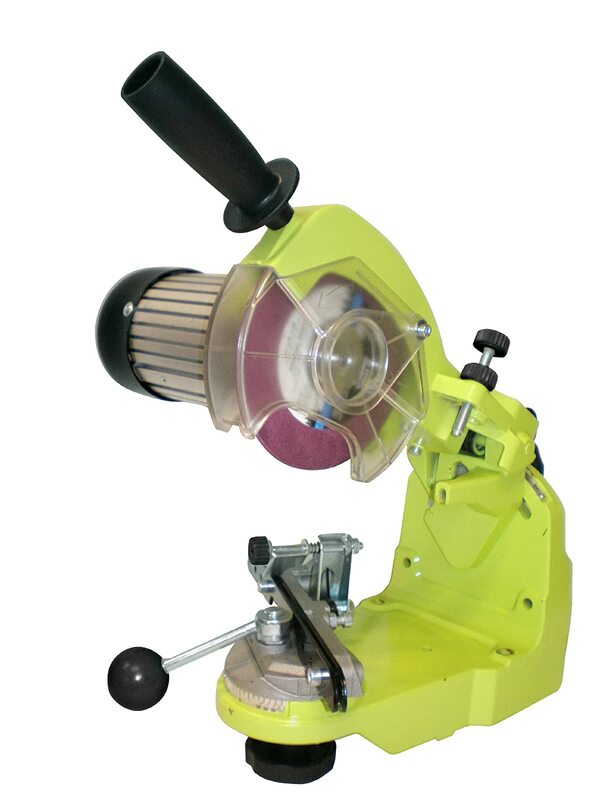 For our Silver Pick Runner-Up, we have the Timber Tuff chainsaw sharpener. Much like the Oregon Company, Timber Tuff is a company that specializes in lumber based tools—especially chainsaw and chainsaw related tools. However, compared to the Oregon Company, Timber Tuff is arguably more of an expert in this field. They offer a wide variety of tools for the consumer and for industrial purposes. In fact, it seems the best chainsaw sharpeners are made by companies that specialize in chainsaw and the lumber industry in general. While this makes sense, it is a bit surprising that some of the bigger and better known makers of power tools have not already jumped on this bandwagon. This leaves the potentially lucrative market of chainsaw sharpeners relatively sparse when compared to all of the makers of more common types of tool like drills and construction saws. Regardless, Timber Tuff is easily the closes competitor with the Oregon. In fact, the Timber Tuff seems to be the only other manufacturer of chainsaw sharpeners that understands the careful balance needed to ensure that the tool is able to effectively and consistently sharpen the blades while minimizing the potential risk of weakening or breaking the chain. Much like the Oregon, the Timber Tuff achieves this task in a large part through an effective distribution of grinding power. The Timber Tuff generates 3,600 rpms. This is only 100 rpms more than the Oregon, and we would not be surprised if this was done as something of a gimmick to convince uninformed consumers that the Timber Tuff was a superior product based on that spec alone. Timber Tuff complements that appropriate rpm grinder speed with a solid motor that has 110V. This is only 10V less than the Oregon, so you know the Timber Tuff has enough power to handle the resistance of grinding metal in a precise fashion. Again, like the Oregon, the Timber Tuff does its best to minimize the use of hard plastic and arguably accomplishes the task of using more metal for its components than the Oregon. Of course, at this point, we would be splitting hairs as the frames of both chainsaw sharpeners is mostly metal. Much like the Oregon, this makes the Timber Tuff far more resistant to vibrations which allows you to have a far more precise grinding experience. This lets you sharpen the chain’s teeth quicker while preventing the potential weakening or breaking of the chain. Of course, just like the Oregon, this means you are going to have to make sure that the base the frame is gripped to is sufficiently heavy and stable to handle the weight of the machine with the vibration of the motor and grinding wheel. Unlike the Oregon, the Timber Tuff is a bit more limited in how it can be mounted. The Oregon uses a multiple gripping system that allows it to be mounted vertically or horizontally. While this is technically possible for the Timber Tuff as well, this will cause it to hang against its grip in a way the Oregon does not. Still, this is an incredibly versatile chainsaw sharpener and comes with three different grinding wheels of three sixteenths of an inch, one eighth of an inch, and one quarter inches in size. With these three grinding wheels you are able to sharpen chainsaw teeth which are anywhere from one quarter to three quarters of an inch. It should be noted that the Timber Tuff requires you to personally be more skilled than the Oregon. Whereas the Oregon can be more easily set to sharpen the different sizes of teeth, the Timber Tuff will require you to exert a bit more control. It can take a bit to get used to, and the learning curve can be steep. Essentially, do not be surprised if you do not successfully sharpen your chainsaw teeth on the first try. In this regard, it would not hurt to have an older chain that you do not use as practice for a little bit, so you can get the hang of it. Like the Oregon, the Timber Tuff comes with a work light to help you see. One potential issue is that the safety guard has been known to break. Coincidentally, it is also one of the largest and lightest-duty pieces of plastic on the Timber Tuff. Still, the guard is see through, so as long as it lasts, it at least allows you a better view of your work space so you can grind more precisely. Buffalo Tools may not be as well-known as some of the other tool brands available, but they have made a name for themselves by providing a wide array of tools—many of which are not used for construction. The products Buffalo makes include equipment for your vehicles, like racks, as well old fashioned tools like a traditional ice cream maker. The reason the Buffalo earned out Bronze Pick Third Place position is, because it does most things well without being spectacular. Also, it does not come with some of the bells and whistles that make the better chainsaw sharpeners more convenient. 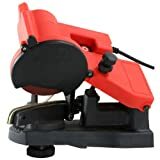 Still there is a serious price to value ration with this chainsaw sharpener that is less than half to one third the price of the first and second place products on this list. In fact, it is this price to value ration that has caused many reviewing bodies to declare this the best chainsaw sharpener on the market. However, those reviews are weighing the price far more heavily and ignoring some its functional limitations and design flaws Still, this is not a poor chainsaw sharpener by any measure and is one of the better pure consumer chainsaw sharpeners. Unlike the previous two entries, this chainsaw sharpener should be used exclusively for personal use. Whereas the Oregon and even the Timber Tuff can be used by smaller lawn care outfits, the Buffalo will not handle as regular a duty as well. One of the issues of the Buffalo is that it has the least amount of metal used in its construction out of all of the items in our list. While this may seem nice in that it makes the product far lighter, it also makes the product less stable. Thus, when using the Buffalo, you can expect a fair amount of vibration. This is frustrating, because the more vibration, the less precise the grinding wheel is. The less precise the grinding wheel it, the more likely you are to accidentally weaken or brake the chain. One way that the Buffalo attempt to rectify this problem is by making it have an incredibly compact design. In fact, the Buffalo is by far the most compact chainsaw sharpener of the group. Again, this is a bit of a mixed bag. While the compact design does provide a lower center of gravity and a bit more stability, it does not do enough to account for the imposition it places on visions. When you are trying the grind small teeth on a relatively thin chain, your ability to judge precisely by sight is paramount. This may require you to get in some awkward positions to see what you are doing which can cause pain or stiffness later on. Still, in terms of its actual primary function—that of sharpening a chain’s teeth—it is not terrible. It also presents other issues that can make sharpening the teeth more difficult. First, the grinding wheel runs at a blinding 4,200 rpms. This might seem like a good thing, but it actually creates more stress on the chain without providing any significant advantage when grinding. Instead, this rate of speed simply adds more heat and friction which may break or weaken the chain you are trying to sharpen in the first place. Still, it can accommodate most chains and easily shifts position for alternating teeth. As a true budget option that still provides excellent price to value ratio, it cannot be beat. Our budget pick goes to the XtremepowerUS chainsaw sharpener. This is not that much less expensive than the Buffalo and still provides a comparable price to value ratio. While this company is not necessarily a market leader in any category, they do have a wealth of experience manufacturing tool in a number of categories from consumer to commercial all the way to industrial needs. This model suffers from some of the same issues as the Buffalo. It has a maximum rpm of 4,200 while the motor is only 85W. While this is still more than enough to handle most chain teeth, it does increase the risk that you will break the chain. Specifically, you have to watch out for the friction from the quickly spinning grinding wheel causing too much heat. This issue is made even more difficult with the fact that the chain locking mechanism is the worst of the group. While it does provide a chain brake with a large handle, that does not change the fact that the actually chain guide does not secure the chain well enough on its own. Part of this problem has to do with the chainsaw sharpener’s material components. There is a lot more hard plastic holding this chainsaw sharpener together than the Oregon. When you couple that with the high rate of rpm, you have a perfect storm of vibrations. These vibrations can cause the chain to wiggle a little bit while being sharpened. While you do not have to worry about anything coming loose to the point where it could fly off or injury you, it still increases the risk of weakening or breaking the chain. 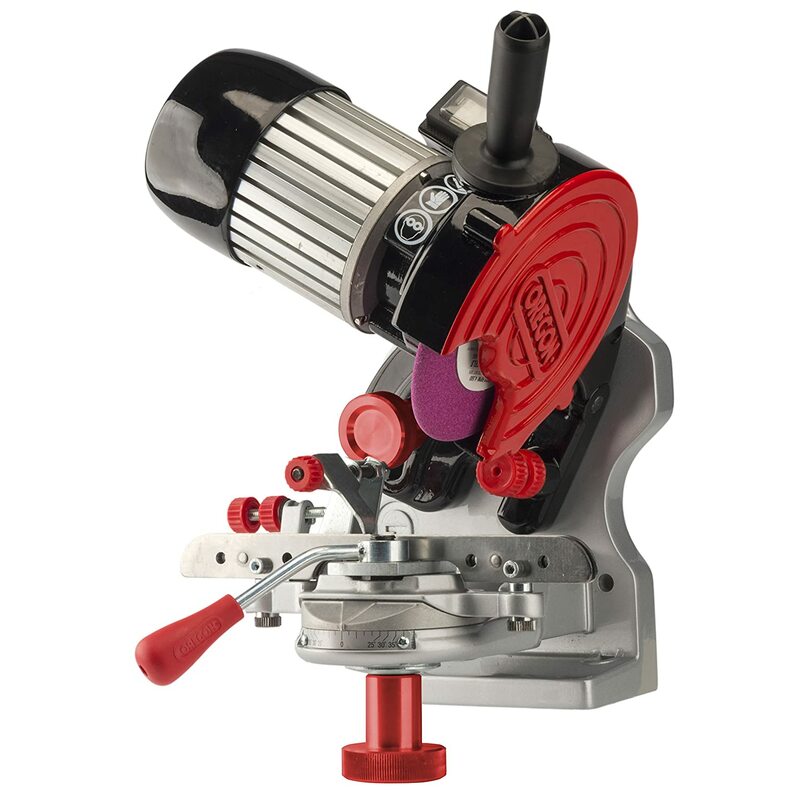 Still this product offers a 35 degree right and left vice angle so you can sharpen alternating sides without readjusting the chain every time, though you will have to shift the vice every other tooth. It also comes with a clear safety guard so you can see your work. Moreover, this chainsaw sharpener follows the trend of the other models on this list and can accommodate a wide variety of chain teeth sizes. Still, it probably would not be a bad idea to spend the extra $10 or so and just get the Buffalo. Even though this is a guide for mounted chainsaw sharpeners, there are actually a few design types out there. Of course, there is the tried and true, traditional file, but that takes a fair amount of work and a considerable amount of time. Moreover, this requires expert technique or you could end up weakening the chain instead. In the powered realm, there are also handheld chainsaw sharpeners. Many people who use chainsaws all the time and are forced to sharpen the chain’s teeth regularly swear by this tool over the mounted electric chainsaw sharpener. There is a big caveat to this: even more than with a manual sharpener, you really have to know what you are doing. If you do not, not only will you fail to sharpen the teeth, you very well may break the chain or weaken to a point where it breaks while in use. The final category is the mounted electric chainsaw sharpener. This is a fairly large tool that requires a sturdy place to mount it. It is specially designed to make sharpening the teeth of chainsaws a breeze. If you choose to go the route of a mounted chainsaw sharpener, then one of the primary consideration has to be the actual mounting frame. There is a surprising wide divergence of mounts within this relatively small market. In fairness, the actual sharpening mechanism is almost always universally the same. Moreover, the mounting mechanism itself is also often very similar. The size of the mount includes a fairly large range of sizes. Part of this has to do with the differences in the motors of the chainsaw sharpeners. A larger or more powerful motor will inherently require a larger mounting frame to keep it stable and in position. Rarely in power tools is less power a good thing—at least as a maximum limit. The chainsaw sharpening field requires a delicate balance. Too little power and you will have to spend an exorbitant amount of time sharpening the teeth of your chainsaw. However, too much power and you will risk weakening or breaking the chain altogether. That is why electric mounted chainsaw sharpeners require a bit of a goldilocks approach—Not too weak, not too powerful. However, judging the power of a chainsaw sharpener can be a bit tricky. First, you have to consider how fast the grinding mechanism rotates. This is usually measured in rotation per minute. Generally, the more rotations the better. Of course, this has to be carefully balanced with the other factor when determining the power of a chainsaw sharpener: the motor’s power. The higher the motor’s power, the more likely it is able to handle the resistance and friction of the teeth without slowing down or stalling out. Still, if you have an incredibly powerful motor combined with exceptionally high rpms, then it is far easier to weaken or break the chain by accident. Most chainsaw sharpeners will have the machinery and other assorted parts made from some kind of metal. However, rarely is the entire machine made from metal. Like a number of other types of power tools, most chainsaw sharpeners have a combination of metal and hard plastic materials. Obviously, the more metal that is used, generally the better the quality the chainsaw sharpener. However, this comes at a bit of a tradeoff. Metal is far heavier than plastic, so a chainsaw sharpener that is mostly metal will require a much beefier base on which to mount. 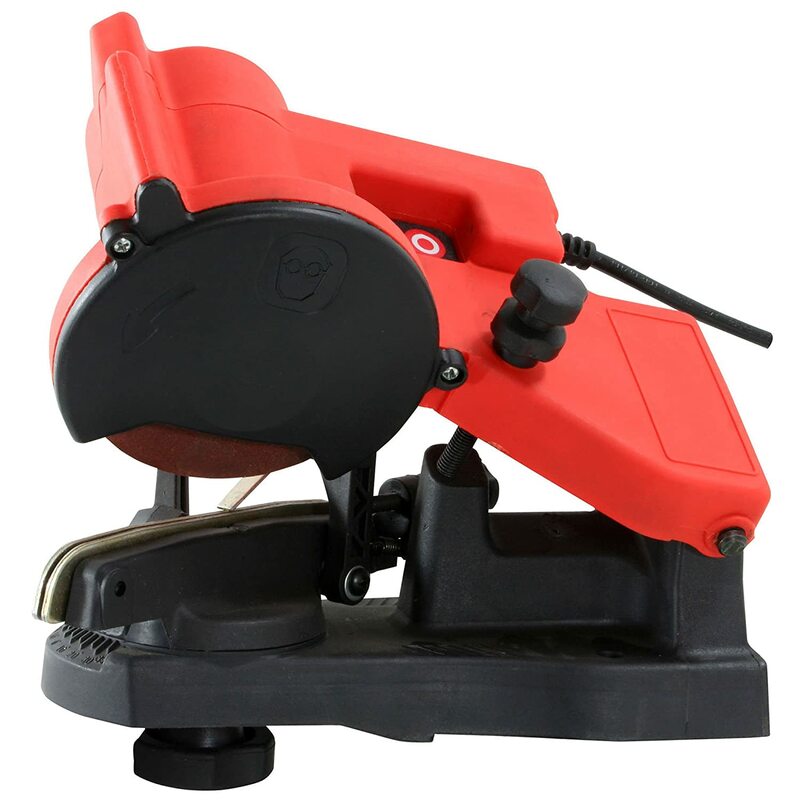 While a chainsaw sharpener that has a mostly plastic frame may be acceptably mounted on a wooden horse arrangement, a chainsaw sharpener that is mostly metal will require a much larger, heavier, sturdier base on which to mount. Still, the mostly metal chainsaw sharpeners are the better option. Most chainsaw sharpeners actually sharpen the teeth of a chain with an abrasive grinding pad. In fact, the electric chainsaw sharpener is really just a modified grinder that has been designed explicitly to sharpen the teeth of chainsaw chains. However, the pads themselves can come in a variety of sizes, abrasiveness, and materials. All of these factors will determine how effective the grinding pad is at sharpening the chainsaws teeth, how long the grinding pad will last, and whether or not the pad will give or take if the machine is not used properly—in this case, will the pad break the chain or start to breakdown itself. However, most grinding pads are made from sturdy enough material that they will break the chain before they themselves break—though a weaker bonded material will provide more give. Generally, they are made out of a composite material that including a cemented mixture. The most common types of basic grinding pad materials that are common abrasives are aluminum-based, silicon-based, or ceramics. Grinding pads also come in diamond and cubic boron nitride materials that are known as superabrasives. This is a twofold consideration. The first part relates to how often you use your chainsaw in the first place. If you mostly have a chainsaw for rare instances and generally do not use it that often, chances are you can get away with a lesser quality chainsaw sharpener. However, if you find yourself using your chainsaw for hours at a time on a weekly or even daily basis, you might want to invest in one of the better chainsaw sharpener, since you will be using it more often. The other component has to do with what you are cutting. Even if you only use your chainsaw every now and then, but you use it to cut incredibly hard wood, you might not want to go with the cheapest option. Similarly, if you use your chainsaw all the time, but rarely are you cutting soft or incredibly dense wood, you may not necessarily need the best of the best. Depending on your needs, there is a clear division between the first two entries on this list and the last two. If you will be regularly sharpening your chainsaw, then it is strongly advised that you invest the extra money and get a better product. The higher end models have a better power ratio to ensure that your chainsaw teeth are sharped while minimizing the potential risk of weakening or breaking them. Moreover, these chainsaw sharpeners are made of better quality materials and provide a more stress-free grinding experience. However, if you are buying a chainsaw sharpener strictly for consumer uses, then one of the two cheaper options should suit you just fine. Regardless, whether you are a small lawn care crew or just a private consumer, this list has a chainsaw sharpener that is right for you.